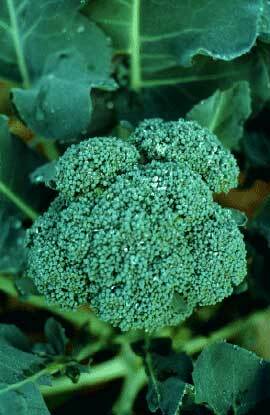 Broccoli is a member of the family which includes its cousins: cauliflower, cabbage and brussels sprouts. Collectively known as cole crops, they are all notorious for their interesting form and color, strong flavor and nutrition. While the leaves and stems of broccoli plants are edible also, it is primarily the large heads of immature flower buds, clustered tightly in a mass at the top of the thick main stems that are harvested for food. They are usually green or bluish green, but some varieties have purplish heads. Their leaves are a matte medium green growing from 4 to 8 inches long along the thick main stem. A cold weather crop, broccoli must be planted early in the spring so that it has time to mature and develop its head before hot weather arrives. Many gardeners grow a second crop, planting seedlings in July, to be harvested in the cool fall weather. Estimate how much broccoli to plant by how many people you normally feed with one head of broccoli from the grocery store. A single good sized head, or more typically, several smaller heads bunched together with a rubber band at the produce counter, usually serves 4 to 6 people. A rough guide for figuring out how much broccoli to plant is to plan for three to six broccoli plants for each person in your family who likes to eat it. Beginning gardeners often find it’s easiest to grow broccoli from young plants, or seedlings, purchased from the garden center. Professionally raised, they are healthy and sturdy and available in your area about the time it is safe to plant them outdoors. If you buy ready-to-plant seedlings at the garden center, look for those with fewer than six true leaves and make sure there are no woody patches on the main stem. This may indicate that seedlings were overwatered or overfertilized in the greenhouse. More experienced gardeners often grow their own seedlings directly from seed. This way they have a much larger choice of broccoli varieties and more control of the timing of their planting so that all their plants do not mature at the same time. In the South and Southwest gardeners can plant the seeds directly in the garden because the late winter is milder and young plants can develop outdoors there, while there is still frozen soil in northern regions of the US. In these areas you must plant broccoli seeds indoors and under fluorescent lights so they get long periods of strong light. Start seeds indoors six to eight weeks before the last frost date. Use a soilless potting medium or other seed starting medium in shallow flat boxes or small individual pots. There are also seed starting kits available for this purpose. Sow seeds about an inch apart, or two to a small pot, pushing them into the moistened medium 1/4 inch. Cover them lightly with the medium and water gently. Maintain uniform moisture and a soil temperature of about 70° F. Seeds should sprout in three to seven days. To prevent seedlings from becoming thin and spindly, keep the fluorescent lights set about one to two inches above the foliage, adjusting them as the young plants grow so that they are always at about this height.